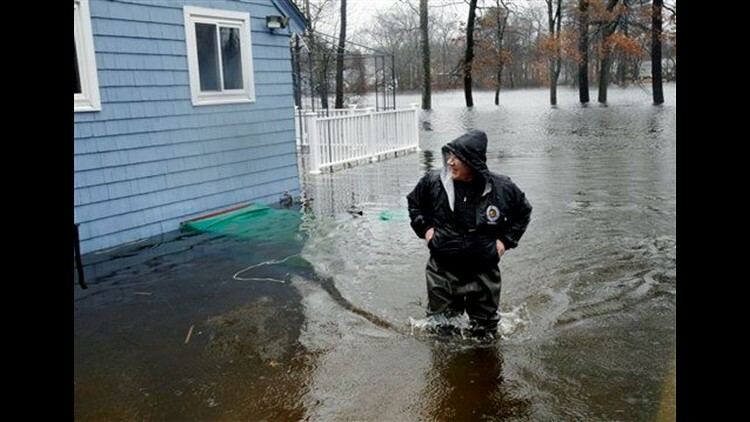 BOUND BROOK, N.J. (AP) — Torrential rains and high winds pounded the Northeast for a third day Monday, taking a heavy toll on people and property in a region that only recently restored power or finished digging out from the last of several major winter storms. The rain and accompanying wind have toppled trees, flooded roads and forced hundreds of people to evacuate their homes. At least nine people have died in storm-related accidents, and nearly a half-million people lost power at the peak of the storm in Pennsylvania, New Jersey, New York and Connecticut. In Boston, the storm threatened to overwhelm the wastewater system, forcing officials to begin a controlled release of untreated wastewater into Boston Harbor. Some parts of Maine received as much as eight inches of rain, and utility officials blamed high winds for broken tree limbs that fell on power lines and caused outages in the eastern towns of Deer Isle and Stonington. The ferocious storm led to near-record numbers of 911 calls in New York. New York City experienced its second-highest volume of 911 calls ever. It got 65,000 between 11 p.m. Friday and 11 p.m. Saturday, second only to the 96,000 made during the 2003 blackout. While the rain tapered off south of New York on Monday morning, wind-whipped precipitation still fell in New England. In Boston, workers put up sand bags around the entrance to a subway station near Fenway Park on Monday morning as the Muddy River rose. The Massachusetts Port Authority said the weather was causing some delays and cancellations at Logan International Airport, and several roads and highway ramps in the state were closed. The release of wastewater into Boston Harbor poses a minimal risk to public health because the sewage will be diluted by rain water, said Fred Laskey, executive director of the Massachusetts Water Resources Authority, acknowledging that it was a storm of "historic proportions." There also were road closures in southeastern New Hampshire due to flooding. In New Jersey, Gov. Chris Christie declared a state of emergency, allowing National Guard troops to be called up if needed. Schools closed in Massachusetts, Connecticut and New York on Monday. In low-lying Bound Brook, N.J., site of several major floods in the past decade, Mayor Carey Pilato credited a $100 million flood control project, begun after the remnants of Hurricane Floyd caused major flooding in 1999, with sparing a six-block area of the town that had been hit hard then and during a nor'easter in 2007. Mark Wilson, director of a soccer academy that sits in the middle of Bound Brook's hardest-hit area, said the first-floor carpets were damaged and the basement was filled with water. Still, he said, this round of flooding paled in comparison with 2007, when his company was in the middle of renovating. "We had 4 feet of water throughout the whole building, and under that was a half-inch of river silt," he said. "There was a certain degree of faith that it wasn't going to happen again, and here we are three years later. But it's definitely a big improvement." In Atlantic City, snow plows that just weeks earlier had been dealing with the worst snowstorms in more than 100 years were pressed back into work, scraping away tons of seaweed that had floated several blocks inland and made parts of a major highway into and out of the gambling resort impassable. Still, at least 600 residents remained in the local high school and a church while inspectors checked their houses and utility crews turned off gas lines as a precaution. Across the state, more than 100,000 customers were without service Monday, down from a peak of 235,000. In Connecticut, two major utility companies said more than 57,000 customers were still without power, down from about 80,000. Rhode Island officials were briefly concerned about whether a dam on the Pawtuxet River in West Warwick would break but later said there was no immediate threat. The storm carried wind gusts as high as 70 mph and came about two weeks after heavy snow and hurricane-force winds left more than 1 million customers in the Northeast in the dark, many of them in New Hampshire. The storm has killed at least nine people across the region, including several who were hit by falling trees or limbs. Contributing to this report were Associated Press writers Ray Henry in West Warwick, R.I., Karen Matthews in New York; Bob Salsberg in Boston; and David Sharp and Clarke Canfield in Portland, Maine.